The Jeep Compass is a mid sized SUV, similar in size to a Nissan Qashqai. 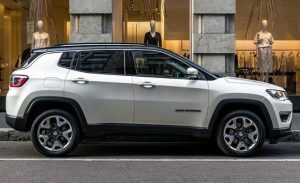 While it shares a platform with its stablemate Renegade, albeit stretched by 7cm, the Compass looks far more SUV with its traditional Jeep grille and rectangular wheel arches, the sweeping lines give it excellent kerb appeal. The driving position is commanding and the steering very light making it a super car for driving in town, you do loose some feel and sense of fun through the twisties as the Compass is set up for comfort over driving thrills. Rear visibility is not great but Longitude trims and above come with a reversing camera. The boot has an adjustable floor and a maximum of 438 litres of space, slightly bigger than the Nissan Qashqai and smaller than the Peugeot 3008 and Seat Ateca. The boot is also narrower due to the rear wheel arches encroaching into the space. Three trim lines are avaialble to mobility customers, Sport, Longitude and Limited. The entry level Sport comes with a 5 inch touchscreen, air conditioning, cruise control, a leather-trimmed steering wheel, 16-inch alloy wheels, LED brake lights and forward collision warning that beeps if you’re too close to the car in front. The Longitude is the pick of the trim lines as the touchscreen is upgraded to 8.4 inches and includes Apple Carplay/Android Auto and a built in Sat nav and reversing Camera. You also have two-zone climate control, adjustable lumbar support, 17-inch alloy wheels, electric folding door mirrors, automatic headlights, cloth/faux leather upholstery and keyless entry and keyless start. The Limited trim adds leather seats, tinted windows, rain-sensing windscreen wipers, auto parking, heated front seats and steering wheel, 18-inch alloy wheels, 8 way electric adjustable front seats with driver memory and a dual pane electric opening panoramic sunroof (this does impact on headroom). 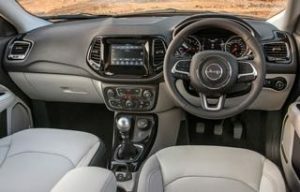 The Compass, as a manual gear-boxed car, is avaialble with a 1.4 litre petrol with 138 bhp and two diesels, a 1.6 litre offering 118 bhp and a 2.0 litre with 138 bhp that is also all wheel drive and the pick for towing as it has a braked weight capacity of 1900 kg. The 1.4 petrol is our choice, it is quiet and nippy, 0-62 mph in 9.9 seconds, economy is a claimed 41.5 miles per gallon. The two automatic offerings are the 1.4 litre petrol and 2.0 litre diesel, both have a super nine speed gearbox are all wheel drive only and offer 168 bhp, both can reach 62mph in 9.5 seconds. The diesel Auto has a braked towing capacity of 1500kg compared to 1000kg for the petrol car and has the edge on economy at 44mpg compared to the lowly 34 mpg of the petrol. 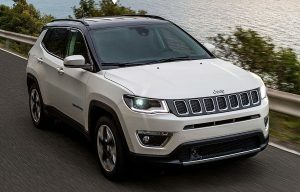 The Jeep Compass is a good looking car and an excellent choice if you want a light to manoeuvre car with the advantages of the raised seat height of an SUV combined with the off road looks of a Jeep. Should you be a low mileage user or just prefer the quiet progress of a petrol engine the 1.4 litre car makes an excellent choice. Prices have been reduced for Q2 2019 and are now back to reasonable levels.